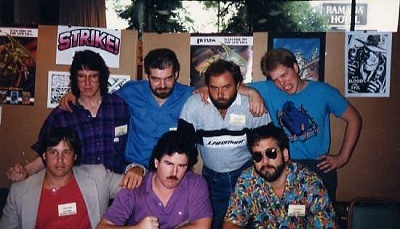 Bottom L to R: Gary Kwapisz, Tim Harkins, Chuck Dixon. 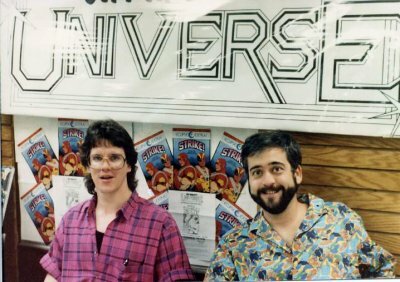 In the early 1980s, myself and some of my soon to be life-long friends were just starting to break into the comic book business as writers, artists, and businessmen. We were all in our 20’s to early 30’s. Most were still single, some of us just married and even had a baby or two at the house. There was no internet. When you communicated, it was with the phone or by hand written or typed letter. I was still doing pitches and comic book stories on a typewriter back then. Even with technology being what it is today, I never look back at using the typewriter as a chore. It was durable and always reliable. Just like my friends were. 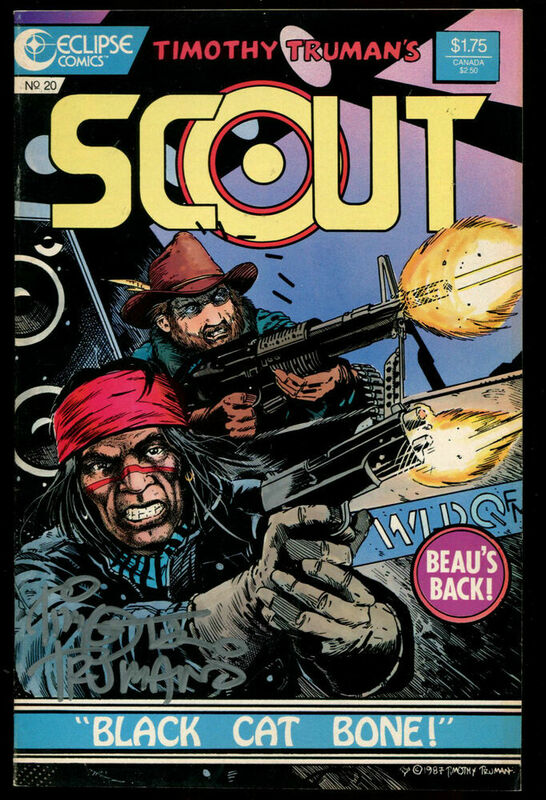 Scout Issue #20 Eclipse Comics. Eclipse Comics was where me and my friends all seem to have met. By friends, I mean my core group; Tim Truman, Chuck Dixon, Flint Henry, Tim Harkins, Gary Kwapisz, John K. Snyder III, Clint McElroy, Ron Frenz, Todd Fox, Tom Lyle, Dean Mullaney, Graham Nolan, Mark McKenna, and Ted Adams. A lot of the guys in that group were from the Kubert School. It was like they already had on the job training, so they shared that with the rest of us. 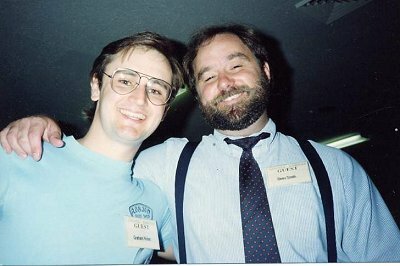 Some of the guys like Truman had already worked for First Comics and brought some of their fellow First workers into our small group; John Ostrander, Mike Baron, and a few others. It was a great time to meet and talk creative comic books with those that knew the shorthand of the business. 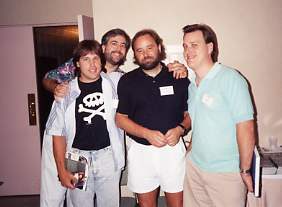 Gary Kwapisz, Chuck Dixon, Beau Smith, Todd Fox. ChicagoCon in Rosemont , IL., probably at that time was the second biggest convention behind San Diego Comic Con. Even then, SDCC was a LOT smaller and most people just had card tables with only a few having booths with displays. Simpler time, but just as important as today. The beauty of having ChicagoCon in Rosemont was you really didn’t venture into Chicago much. We did occasionally for a ball game, but most of the time we all stuck in and around the Rosemont area. We were there for comic books and nothing else. If we wanted to see a big city , the beach, or the country, we took a family vacation. This time was for us and what we hoped would be our new career. 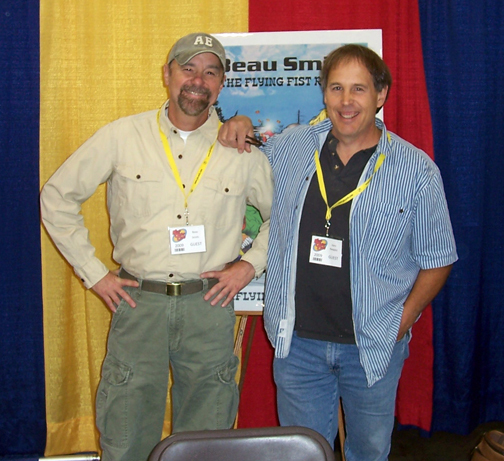 Tom Lyle and Chuck Dixon. Would not trade those memories for anything. We talked so much about comic books; past, present, and what we thought would be the future. We talked art, art styles, how to open a story, what characters were important, what editors we talked to….that’s right, I said editors. We didn’t spend a lot of time talking about what creators we met, nope. We knew if we were going to be in the business or stay in the business, we needed to contact and build a relationship with the folks that did the hiring and firing. Other aspiring creators thought that knowing other creators was the short way to the barn, but in reality, why would another artist connect you to possibly one day take their job away? 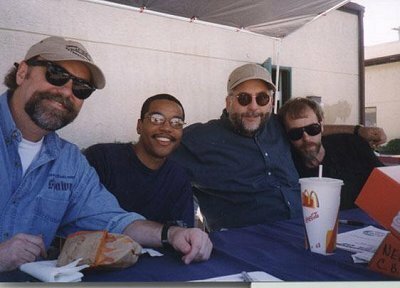 Beau Smith, Dwayne Turner, Chuck Dixon, Flint Henry. Like I mentioned, some of us were already in the business so it was a great way of us all sharing important information and contacts to move ahead in a business most of us had been wanting to be in since childhood. We all came from various paths of life; it was comic books that brought us all together. Comic books seem to be this wonderful common bond that used to be a True North source that everyone could set their compass to. I don’t know if that rings as true as it once did. I hope so. As our core group got older, we all went from being 4 Winds, to being scattered to the 4 Winds. Most of us had families, children, houses, and all the other stuff you accumulate in life. These days, some of us are grandparents, are mentors, and even some have gone on to careers outside of comics that they truly enjoy. It’s an amazing path with an even more amazing amount of wonderfully creative people that we have met through the years. A blessing that we should always be thankful for. We don’t talk as much as we once did. Technology has us doing that digitally for the most part. When we do have the occasion to pick up the phone, we almost always find ourselves right back where we were the last time we spoke, that could be 20 years or 20 minutes ago. There’s a bond there. There’s a remembrance of a very special time when each hand was out there to pull the other up the mountain. Our careers have changed, our hairlines and waistlines have changed, but we haven’t changed in our heart of hearts. Comic books and the craft of making them is still there and beating stronger than ever. So are the memories of those very special times when the passion for comic books was like the rays of the sun. I promise you, those memories are never forgotten. Pike:We’re not gonna get rid of anybody! We’re gonna stick together, just like it used to be! When you side with a man, you stay with him! And if you can’t do that, you’re like some animal, you’re finished! *We’re* finished! All of us!